Stencil and Stakes, Easy Step by Step Instructions and White and Pink Paint Canisters. Everything you need to create this amazing logo to help show your support during the month of October. 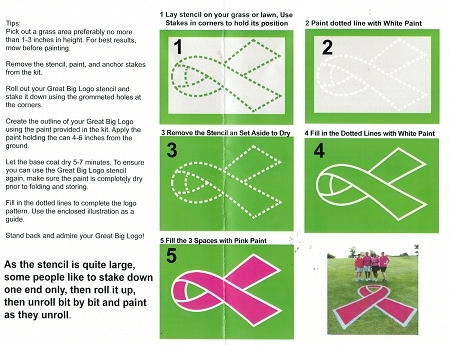 *If we interested we also have a used stencil outline and instructions for the logo. All you'd need to do is by the white and pink field lining paint. For this we're only asking you to pay the price of shipping and to send us a picture of the logo on your field. Please Call if you need more info.